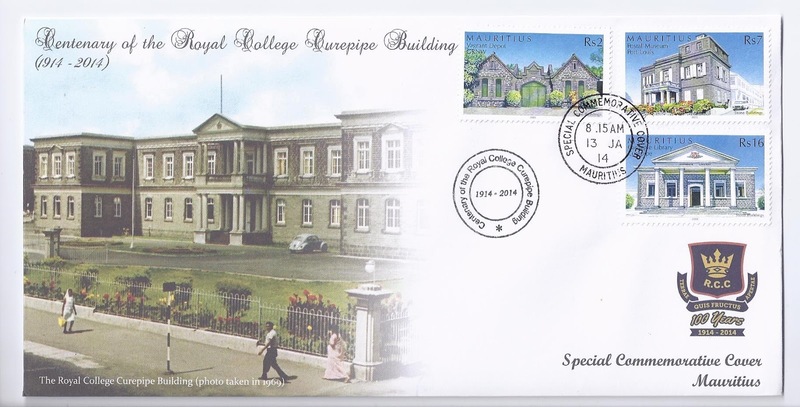 The Mauritius Post issued a Special Commemorative Cover (SCC) on January 13, 2014 to mark the centenary of the Royal College Curepipe (RCC) building. 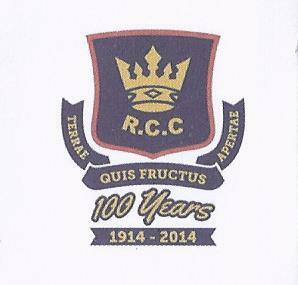 The RCC Motto: 'Terae Quis Fructus Apertae', standing for 'Fruit of the Cultivated land', which could be translated as 'Education provides culture'. 1 October 1912: Sir Robert Chancellor, the then Governor, and Mr. Paul Le Jufe de Segrais, the then Director of Public Works, laid down the foundation stone of the present building, which was to replace the prvious one. 13 January 1914: The building was inaugurated. 1920s: A police station, a Court House House and a gymnasium was built on a strip of land forming part of the school playing field. Somewhere along the line, an auditorium, a semi-circular block of classrooms, a block of science laboratories and a canteen were added to the infrastructure of the Royal College. 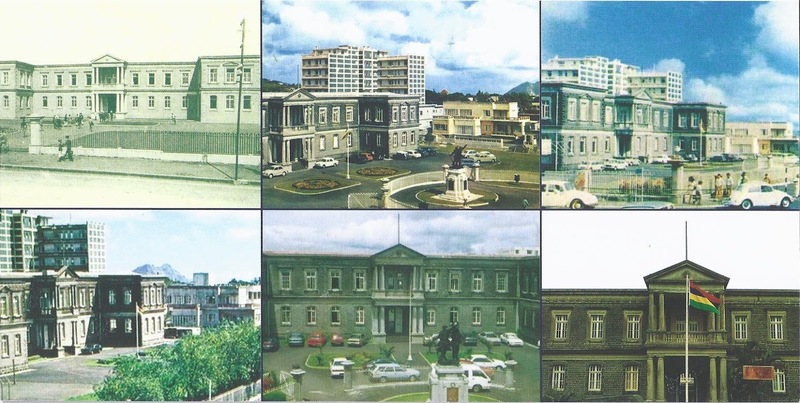 2002: Major renovation works, at the cost of around Rs60 million, were carried out; Form I-V classes were held in a building a few kilometres away in Floréal. 2003: Renovation completed and the Royal College reopened as a Form VI College but was thereafter converted back to a Form I-VI National College. 25 June 2009: Vasant Bunwaree, the then Minister of Education declared: "It would be advisavble to devote some space in the building to set up a Royal College Curepipe museum." 13 January 2014: Centenary of the inauguration of the building. N.B. : The two timelines above are from the SCC insert; any factual approximations and/or mistakes are not mines. All three stamps are from the 'Stone Buildings' issue of October 9, 2005. Espagne - Merci à vous Luc et Gilles pour votre carte d'Espagne. Liechtenstein - Pfalzerhutte - Pfalzerhutte, Malbun, Liechtenstein. Thanks to Thibaut of Switzerland who visited Liechntenstein. Postcards, stamps, covers, FDCs and anything related to postal stationery. Cover from Italy - Thank you Raffaele! http://api.ning.com/files/CCRjzAqgIqjmvl*SlpCtv9Vw9CJVX2cbZW-hTR1o9fW00LMYdWdlrcba-XPUzr9PGgzVe9Xbd. Watermark theme. Powered by Blogger.